As we wait for our next litter of itty bitties to arrive, I'll continue to post more of our darling Draper kittens. I still have lots to share with you. Hopefully, our wait won't be too long. 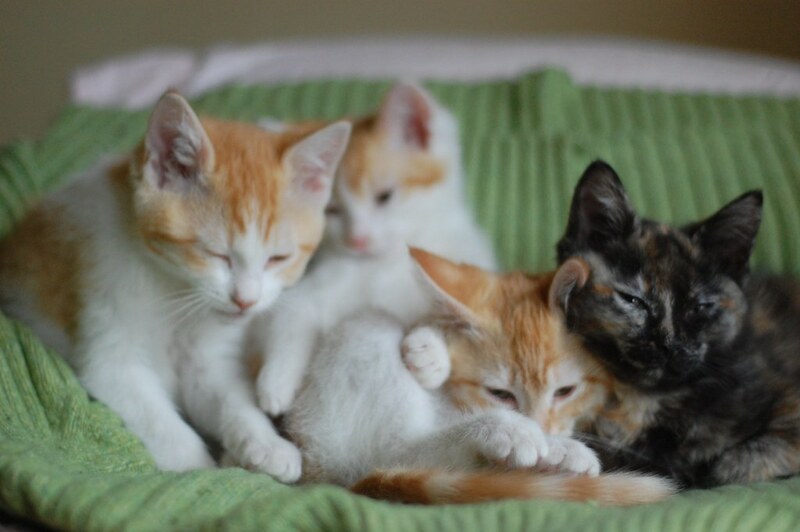 Kitten season is pretty much over, but there have been a few babes trickling into the shelter. One hates to play favorites (they're ALL such cutie patooties!) but I think that the Drapers were my fave bunch so far. The next group will probably surpass them though.. they always do. Any tips on keeping kittens with nuclear energy AWAY from the Christmas tree?? I found a solitary kitten by the side of the road last week, huddled next to a concrete wall, captured him/her, and brought it home. We are past the hissing/fearful stage and now into the playing stage. What do you do about fleas on a kitten about 5 weeks old? 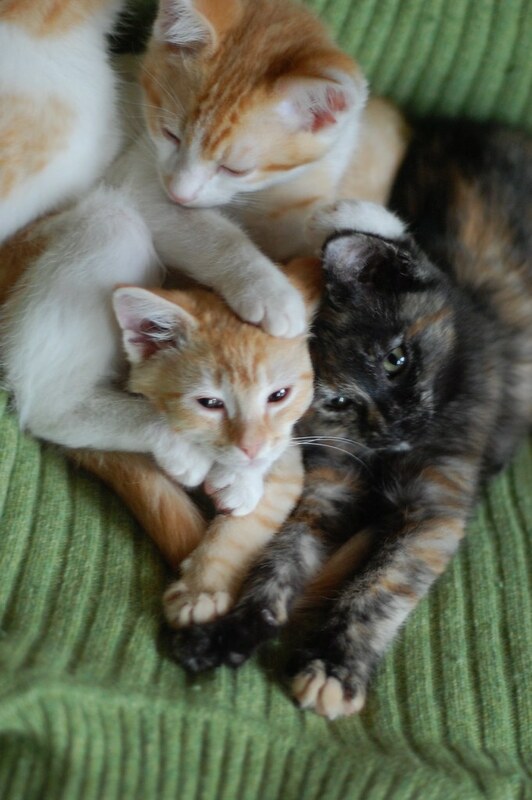 Lovely kitten pile. Sigh... Never realized how striking were Luella's orange stripes before she left. So pretty! Faith J -- kitten needs to be seen by the vet -- a capstar pill will kill the fleas instantly, then you need some frontline after that. The De Flea line of products is great. It works and it's all natural ingredients so it's safe to use on your kitten. I've used it on my cats and the fleas were gone within a few days. I especially recommend the Pet & Bedding Spray. Awww ~ we love to come over to yoor blog to see the itty bitties ~ it makes our day! A flea bath, or any good thorough bath that gets rids of fleas and eggs, might be all he needs, since you've brought him out of a flea-infested environment. He won't like it, but he'll feel better after. Faith,,, I'm always hesitant to give out medical advice for kittens. I would suggest calling your vet and find out what they recommend for a kitten that age. At the same time, schedule a wellness exam. Thanks everyone, I put some De Flea spray on her (but bottle says kittens over 12 weeks only) and will take her to the vet later this week. I wanna squish 'em all! Louella, your sister's head is NOT a pillow! Every litter is the CUTEST EVER, and the DRapers were no exception. Adorable! Also of grown up itty bitty alumni if you have any photoes or visited any of em... pleeease laurie!!!! 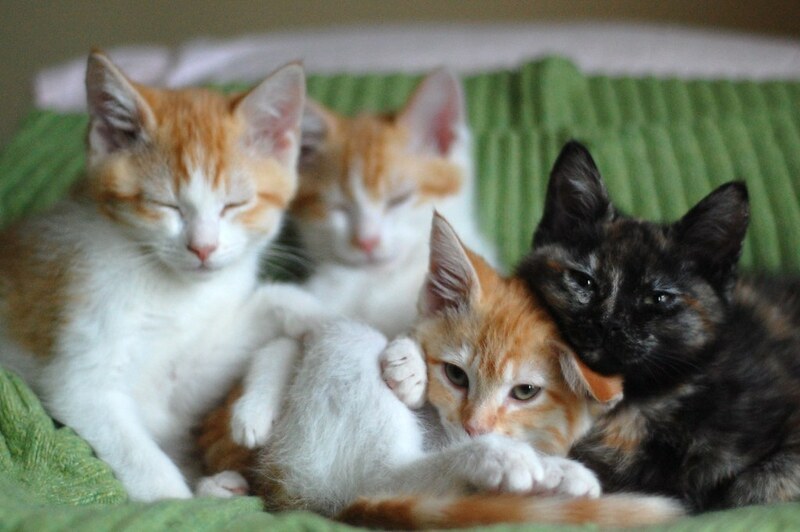 Lovely series of lovely and loving kittens. I hope (ANY IBKC alumni) new families will take a holiday photo of their furry treasures so their fans can share their beauty and love. Any who have already...many purry THANKS! Faith J, I hope you can get rid of the fleas. Thank you for saving this kitten. He/she is now safe and warm and away from the cold winter wind. More importantly, it knows what it's liked to be loved. I hope everything works out. I hope there won't be any new kittens who need foster homes for a long time. But it's good to know you'll be ready for the next litter when it happens. thank you for posting pictures of the Drapers. I will try to post some recent photos of them on facebook. 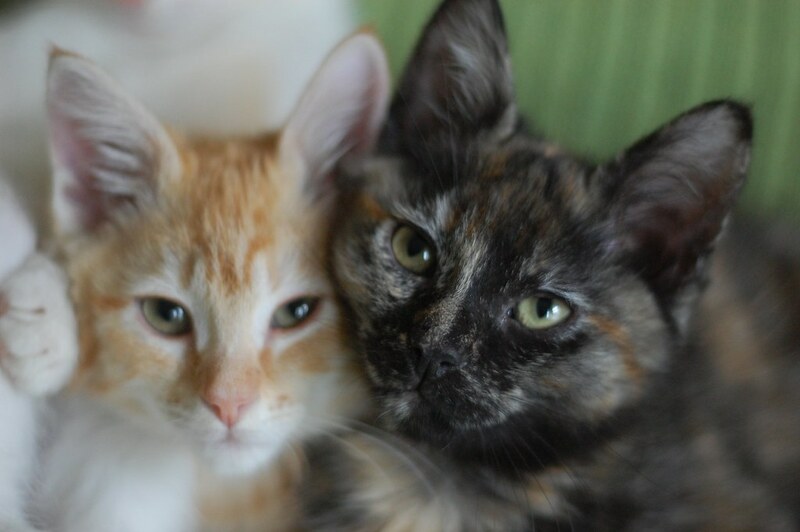 Luella and Perry are healthy, happy, loving members of our family. Always grateful to you Laurie.